Today I spent most of my day researching a good entry level security camera system for my home. The range and diversity of the technology in this market space is considerable. Security cameras are largely separated into analog or digital platforms. There are a lot of factors to building a security camera system. Here are a few big considerations. Analog Pros. Analog cameras have been around for a very long time and they are a very well established technology. The upshot of this is the generally lower cost of entry to build an analog based system. This is a great choice if your looking to just put up cameras. Analog Cons. The technology is showing its age. Upper end analog cameras can not produce the same level of detail that upper end digital cameras can produce. Analog cameras also have cabling requirements that can become cluttered (e.g., video, audio, alarm, and power running across separate cables). Analog systems also require a centralized video management system to either display or record analog signals from the cameras. Digital Pros. These cameras can have outstanding image quality. They can run on TCP/IP networks, which means they can be accessed from the internet, individually if desired. Some models of digital cameras can take advantage of power over Ethernet (POE), meaning one small cable to do it all. They also can leverage wireless connections for areas where running network cable would be challenging. The cameras can also process and, on some models, store the video stream or take snapshot pictures locally on the camera, essentially creating a decentralized system. Digital Cons. The newest technology often comes with a higher price tag, especially with the ability for the cameras to do everything locally. Oh remember these things can be connected to the web? Guess what that means. They can be susceptible to hackers and consequently others may be able to see your video streams. (This can also be true for a analog system that uses a digital video recorder connected the web.) There are a lot more factors to image quality with digital cameras, it is just not as simple as analog platforms. Additionally, the devil is in the details for digital cameras. You have to know the jargon and specifications to ensure to get the desired performance (e.g., H.264 vs MJPEG) and to plan a system that can support them. 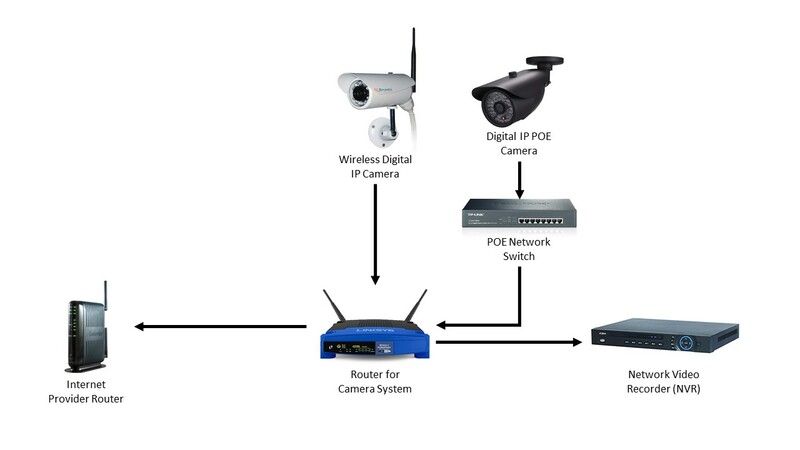 I have opted to build a digital camera system connected to my local network which leverages POE. This construct provides the ability to place cameras where needed utilizing one Ethernet cable to handle both the data and provide power. Going wired instead of wireless also means an additional layer of security as well as reduced demand on my available wireless spectrum. Expect more to come as I build and evaluate the system.